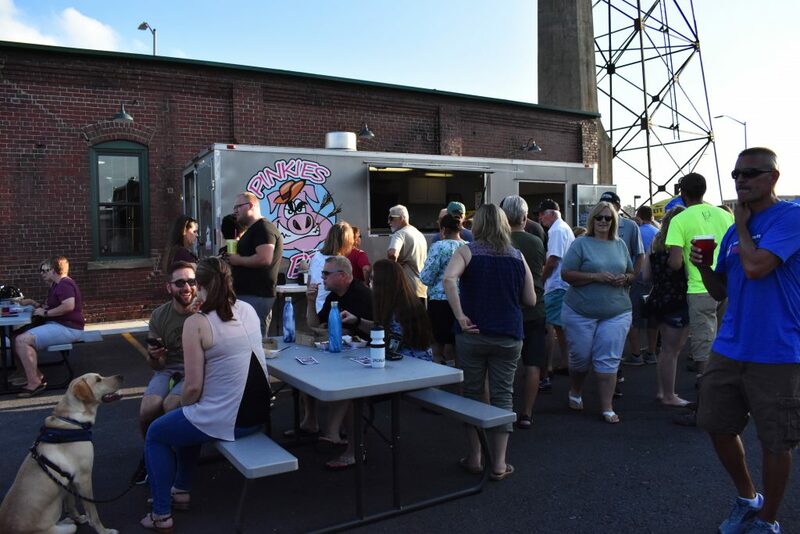 Provided by Kelly Ng A variety of local food trucks lined up outside Lackawanna Train Station last Thursday for the opening day of Trucks on the Track. Just a block away from State Street at the Historic Lackawanna Train Station sat about a dozen food trucks for Binghamton’s first food truck festival, Trucks on the Tracks, last Thursday night. Built in 1901, the train station was once a center for passengers and freight, particularly anthracite coal, during the early 20th century up until its decline beginning in the 1960s. Now, the Binghamton landmark has been revived as a result of a yearlong effort from Jay Pisculli, a partner at Craft Bar and Kitchen and Social on State, and Mark Yonaty, who owns the historic station. At Trucks on the Tracks, the sweet and savory options were extensive, with food ranging from chicken tacos to funnel cakes. Additionally, every vendor was locally sourced from neighboring areas like Cortland, New York and Friendsville, Pennsylvania. While I’ve had my fair share of barbecue chicken, macaroni and cheese and most of what’s considered all-American fare, I chose to try the Venezuelan arepa vendor. An arepa is similar to a flatbread made out of ground maize dough and is most prominently featured in Colombian and Venezuelan cuisine. This food truck’s take on the traditional South American dish featured fresh spices, onions and savory chicken. For a kick of sweetness, the arepa had a peach at the bottom of the wrap-like entree to balance the savory flavors. The once-abandoned train station area was now bustling with local students, families, dogs, live music and plenty of the sights and smells of each vendor’s fare. A building on the property that was also once abandoned was transformed into an ice cream shop, Scoopy Doo’s Old Fashioned Ice Cream, featuring soft serve and hard ice cream flavors as well as a long list of specialty sundaes. While patrons enjoyed their food, drinks and sweets, vendors were hard at work keeping up with the demand from the steady crowd that entered the Lackawanna Train Station throughout the night. Overall, it was a rally for local businesses to show off their skills and for people to go just a little further down State Street to enjoy a meal with friends and family. Trucks on the Track has three dates left this summer: Sept. 13, Sept. 27 and Oct. 11 from 5 p.m. to 8 p.m. at 45 Lewis St.